Tumble Tots is the UKs leading physical play programme for children from 6 months - 7 years. They have over 500 centres in the UK and around 60,000 children attending their classes every week which are designed to develop childrens physical skills of agility, balance, co-ordination and climbing, as well as their positive personality traits including self-esteem. 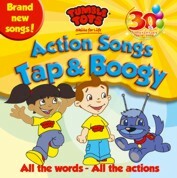 This year Tumble Tots will be celebrating its 30th anniversary and as part of the celebrations we present the latest addition to the Action Songs series: Tumble Tots Action Songs Tap and Boogy. There are 22 brand NEW action songs to sing and dance to, with the lyrics and actions to each song contained in the accompanying booklet. Tumble Tots Action Songs are a great way to develop co-ordination skills, so shake your bean bag and tap youre lummi sticks as you enjoy bopping and boogying to these fun NEW songs!